Crow Dog (1833-1910) – Born at Horse Stealing Creek in Montana Territory, Crow Dog was from a family of esteemed warriors and he, too, would grow to build his own reputation in numerous battles. Crow Dog was present when Crazy Horse was killed at Fort Robinson, Nebraska in 1877 and helped prevent a retaliatory attack on U.S. Army soldiers at the fort. From 1879 to 1880, he became the police chief at the Rosebud Reservation. 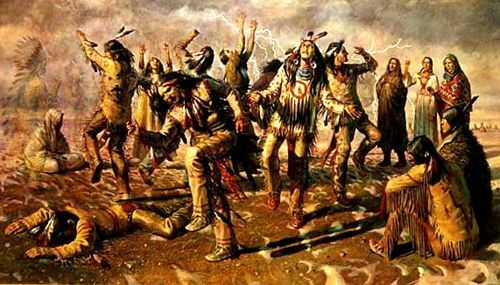 In the meantime, Crow Dog developed a serious animosity with Chief Spotted Tail, who had been accused by Red Cloud of taking proceeds from the sale of tribal land and had been roundly rebuked by Crazy Horse, before he was killed, for signing away the freedom of his people. When Crow Dog heard rumors that Spotted Tail was selling Lakota land to the railroads and building himself an enormous white-styled mansion with the proceeds, Spotted Tail was called before the general council by Crow Dog’s White Horse Group. Spotted Tail denied the charges and the council voted to retain him as head chief, but Crow Dog continued to assert the chief’s complicity in various crimes against the people. Frustrated, Crow Dog carried out his own death sentence on Spotted Tail on August 5, 1881 and Crow Dog was convicted of murder in Dakota Territory. However, he was later freed when the U.S. Supreme Court ruled that the territorial government had no jurisdiction over the crime. Later, Crow Dog was one of the leaders in popularizing the Ghost Dance among the Lakota. He was adamantly opposed to U.S. Army occupation of the Indian reservations and became one of the last holdouts after the massacre at Wounded Knee in December, 1890. Crow Dog spent the last years of his life in relative peace on the Rosebud Sioux Reservation in South Dakota.